Klean Kanteen is a reusable, risk-free stainless steel container that does not leach toxins into its contents. Klean Kanteen is made using 304 L.N. stainless steel which is grade blended specifically for food preparation, dairy, brewing, various medical uses and other applications where mineral migration is unacceptable. The steel is put through an electro-polishing process which seals the surface and prevents minerals from migrating into the contents. Using a premium reusable bottle like Klean Kanteen greatly helps reduce unnecessary environmental waste caused by plastic PET water bottles. Unfortunately, Americans add over 30 million plastic water bottles to our nation's landfills – everyday! The Water Key fully supports and encourages others to start taking steps toward reducing waste by purchasing high-quality, reusable bottles. 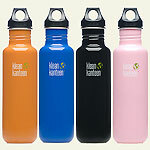 Klean Kanteen bottles are reusable, lightweight & made from electro-polished, non-leaching 304 L.N. (18/8) stainless steel. Available in four sizes (12 oz, 18 oz, 27 oz & 40 oz), it fits most bicycle water bottle cage/carriers. Accessories include stainless steel caps, black sports caps and carrying slings. The black sports cap is made of non-leaching #5 polypropylene plastic. Its wide mouth fits ice cubes. 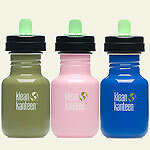 Klean Kanteen's latest bottle comes in a practical 12 oz size designed as a safe alternative to plastic sippy cups. Reusable, durable, lightweight and made from non-leaching 304 L.N. stainless steel. The Avent sippy spouts are made of non-leaching #5 polypropylene. Its wide mouth fits ice cubes.